Following on from their opening wins, Germany and Poland fought out a goalless draw at the Stade de France. Both sides are still on course to qualify for the Round of 16 comfortably. The World champions had faced the Poles en-route to qualification for the finals, with a win apiece on home turf for each side. An intriguing night lay ahead featuring several club teammates on opposing sides, with eight of the starting 22 players currently plying their trade for Borussia Dortmund or Bayern Munich. A capacity crowd of 80,000 packed into the Stade de France for what promised to be an exhilarating night of Group C action, the floodlit pitch was gleaming, and Mesut Ozil got proceedings underway. It took just four minutes for Julian Draxler to ping in a cross for Mario Gotze, but the 2014 World Cup hero could not steer his header on target. Extrapolating from his impressive showing against Ukraine on Sunday, Toni Kroos controlled the tempo and helped Germany boss possession early on, Poland could only chase and watch Die Mannschaft at work. Thomas Muller fizzed in a low cross for Kroos, but the midfielder could only poke the ball wide as he lost his balance. Germany soon had some defensive work to do, as Robert Lewandowski probed forward and had a shot blocked by Benedikt Howedes. The left wing proved to be the main attacking outlet for Joachim Low's team, as Julian Draxler and Jonas Hector combined to expose Lukasz Piszczek. As the first half drew to a close, it had been far from the engulfing game that had been expected, neither keeper had been tested and not a single shot had hit the target. It was Poland who attacked first after the restart and Kamil Grosicki's teasing cross whistled just past Milik's head, putting the German back-line on red alert. The 2008 finalists were straight up the other end though, as Mario Gotze forced a save out of Lukasz Fabianski with his rasping effort. Again Germany were under threat of conceding when Robert Lewandowski stood over an inviting free kick 25 yards out from goal. Instead of shooting on sight, the Bayern striker flicked it back for Milik to strike, catching the wall off-guard and sending an inventive effort into the sidenetting. 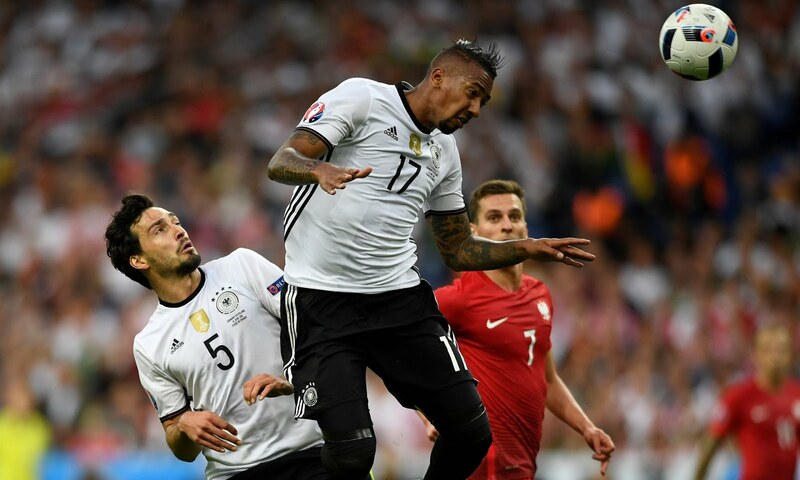 Germany regained possession for a large spell, though they couldn't convert their dominance into frequent chances. At last, Toni Kroos sent a menacing, driven strike over the bar. Gotze was hauled off, as Andre Schurrle took up his position at the forefront of a three-pronged attack. Low's plan hadn't paid off. Milik wasted a golden chance in the 68th minute, fluffing his lines when presented with the ball from 10 yards out. Schurrle was in the thick of it soon after, carving out an opening for Mesut Ozil in the box, but Fabianski was equal to his effort. Both sides seemed content with a point as the game approached its climax. Germany pressed hard but had run themselves into the ground for the preceding 89 minutes, the energy was gone. 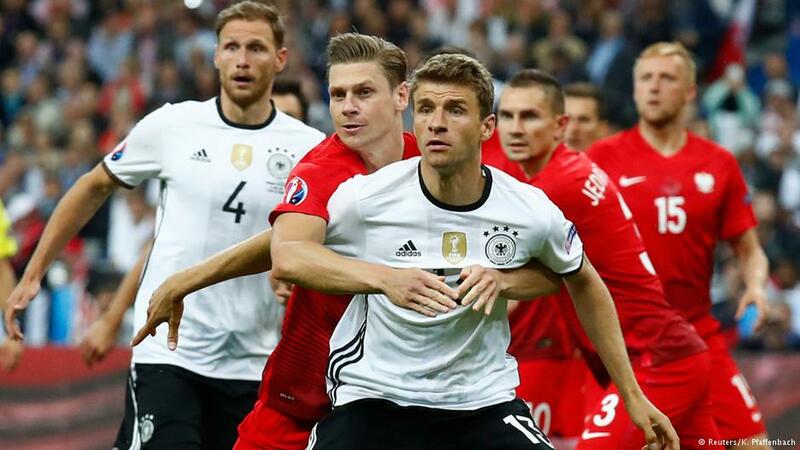 A late scare for Poland was dealt with as a Toni Kroos free kick was cleared away and the whistle blown. Neither manager will be too disappointed with the way things panned out in Saint-Denis, as they both look almost certain to advance, even if that is as a third-placed team. The result knocks Ukraine out from the competition, the 2012 co-hosts becoming the first casualty so far. The game embodied a game of chess, with each defence outsmarting and frustrating the forwards, and Joachim Low will have plenty to think about his plans moving forward with Mario Gotze a failed experiment in the false nine role.